Each winter Crow would migrate to the South. Dawn was free to follow him, and at first she did, by train, but it was too hard to leave her library job and sublet her apartment. Girls, Dawn discovered, are not migratory. At least she wasn’t. During the first season of separation, Dawn thought she would die. No phone calls, no letters. She felt like a woman from another time, waiting for her man to return from the sea or from war. Those last few weeks before true spring, when the tight buds appeared to mock her from the high branches, were the worst. She threw the window open and cawed like an idiot into the street. Perhaps they would come and arrest her. She did not care. She cawed until she could not speak and texted her boss that she had strep. Crow appeared before sundown and found her on the floor. He gathered her up in his wings, and with his beak went over every strand of her hair. Dawn counted as he groomed her, all the way to 105,036. Nobody had ever done that for her before. It took all night and was very soothing. She closed her eyes and slept for twelve hours. The next morning she felt ashamed at having panicked, but Crow carried on like it was any other breakfast, any other day. Crow was so forgiving. It was almost too easy to be a couple. He did not see her faults. He forgot all her misdeeds. And Crow could talk. They knew everyone in the building because nobody could resist the garrulous black bird for long. “When’s he coming back, Dawn? Are you counting the weeks?” the neighbors would ask, winter after winter, passing her on the stairs as the snow fell outside. At times like that, despite her loneliness, Dawn would marvel at her life. I really am doing this, she would say to herself in the mirror. We really are doing this. One day a small black bird landed on the window ledge. Dawn thought nothing of it. She liked all birds now. As she went through her day, the bird grew more and more detailed in her mind. It hopped about. It looked for food. It made a nest. It was a female, Dawn understood, sitting up in bed that night. She ran to the window and checked, though she knew that nothing would be there. The idea that there were female crows in the world ruined her day, then the season, then her life. She knew better than to bring this up with Crow. She could not bear the surprised laughter, the delighted masculine pride. She had already been down this road with men. Dawn dyed her hair platinum blonde and thought about getting a kitten. Crow was late getting home. 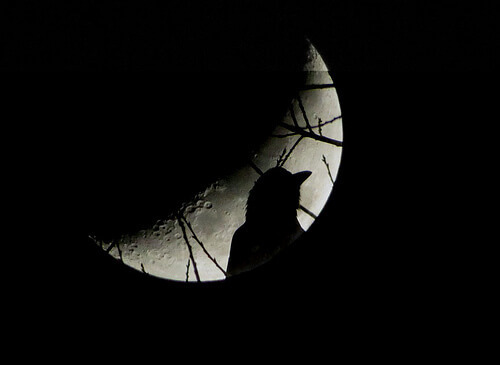 Then there was the night, endless and ink-black, when Crow came home missing a leg. Dawn’s rage surprised her. “What. Happened.” That was all she could manage. “Well then, you can’t go there anymore,” Dawn told him, fully aware that she was being unreasonable. “I assure you it’s not the worst that can happen to my kind,” Crow said, before falling over. Dawn revived him with sugar and water. “I need you here,” Dawn said. She made him vegetable soup. Crow slipped out after she fell asleep. In her dreams she heard the beating of his wings and saw giant black sails on a little boat in the middle of an immense sea. She told him so. Crow did not argue. Dawn was proud of herself for successfully completing an amicable break-up. He said he was sure he would see her again. They separated before the winter began. Dawn’s friends were relieved, but careful with their words. For weeks Dawn didn’t answer her phone. She went in a circle from the apartment to the library until the night her coworkers dragged her to a holiday party in a pub. The smell of the place assaulted Dawn’s nostrils. She gagged. Human wreckage greeted her. Soft features, yellow teeth, and balding heads abounded. Cartoon eyes popped out and assessed her. The ugliness of adult skin was painful. Everyone was either too short or too tall. Someone bought her a drink. Human language, exploding and abrasive, pounded her skull. A machine in the corner played songs that were lies. Dawn lost her friends. She felt faint. She fled to the courtyard. It was a human male who spoke. Dawn had somehow grown away from her mother tongue, but it wasn’t as if she had mastered Crow’s language. She floated, miserable and alone, between the two ways of speaking. It took all of her strength to make small talk with this stranger. His questions assailed her memories. That was true. She was in pain. Crow had changed her. She no longer knew who she was or who she would become. The man gave her a white card with his name and number. Dawn could not help but compare it, unfavorably, to a shiny silver trinket. Then he tried to kiss her cheek. Clarity burst like a storm. “You have got to be kidding,” she said. She dropped the card and ran home. When Dawn walked into the apartment, Crow was waiting, perched on the back of the sofa. “We never really broke up,” Dawn said, to nobody in particular. They had a good spring and summer. The flowers were never more beautiful, and the warm nights had never felt longer. Neighbors and friends dropped by. Dawn even started singing in Crow’s language. When Crow left, on the first chilly morning, Dawn curled up in bed and disappeared into herself. Her body became heavy, disappointingly human. She did not bother calling in to work. Everyone knew how she got in the winter. Jan Stinchcomb is the author of the novella Find the Girl (Main Street Rag, 2015). Her stories have appeared or are forthcoming in Necessary Fiction, Conium Review Online Compendium, A cappella Zoo, and Paper Darts, among other places. She reviews fairy tale-inspired works in Notes From Rapunzel’s Tower, her column for Luna Station Quarterly. She lives in Southern California with her husband and daughters. Visit her at http://www.janstinchcomb.com.